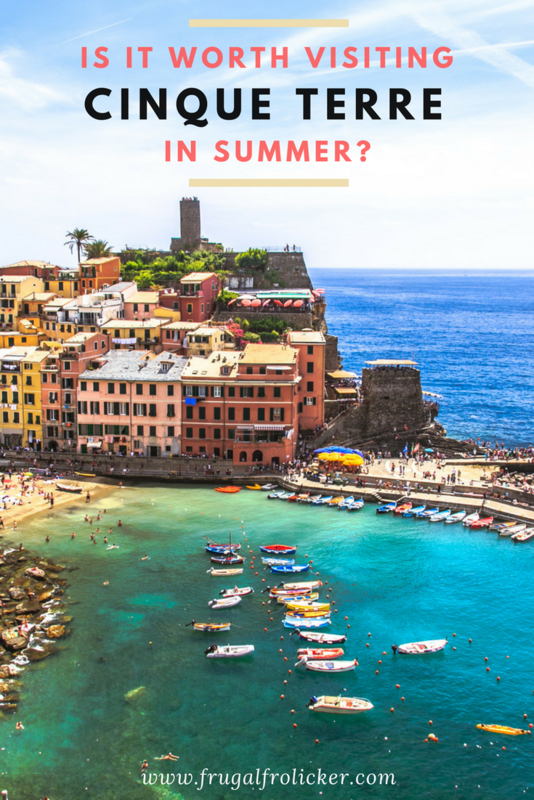 Is Cinque Terre Worth Visiting In Summer? 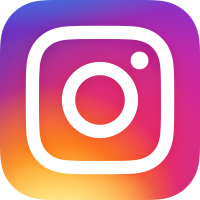 It’s widely known that July and August are the busiest, craziest, most touristy months in Europe, and that for an optimal experience there, you best avoid this time of year. But what if that’s the only time you have to travel? 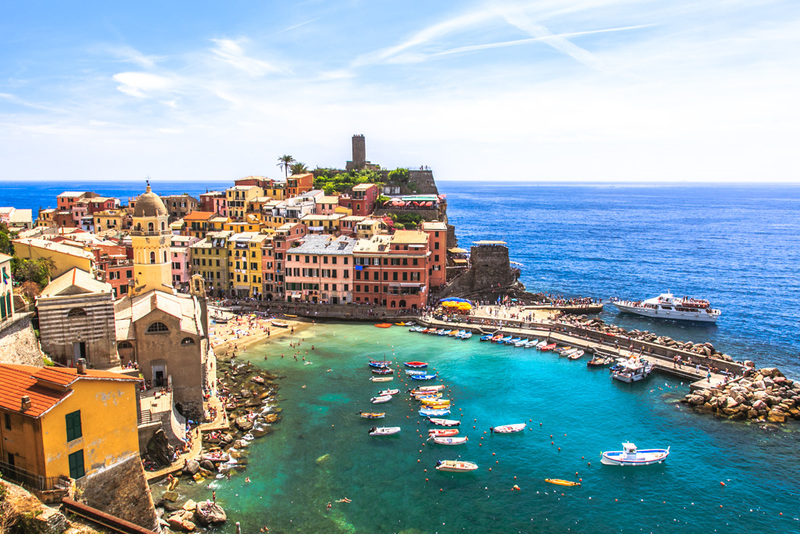 Is it even worth braving the hellish crowds to explore Italy in summer, or other popular European summer spots, or are you better off not going at all? 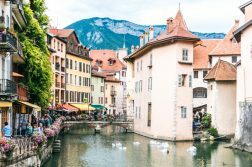 My trip to France and Italy was scheduled for mid July through early August, and my dates were mostly inflexible since I was tacking it onto my existing trip back to the US for a July 7th wedding. So YEP, no two ways about it – I could either do Europe in summer or not at all. 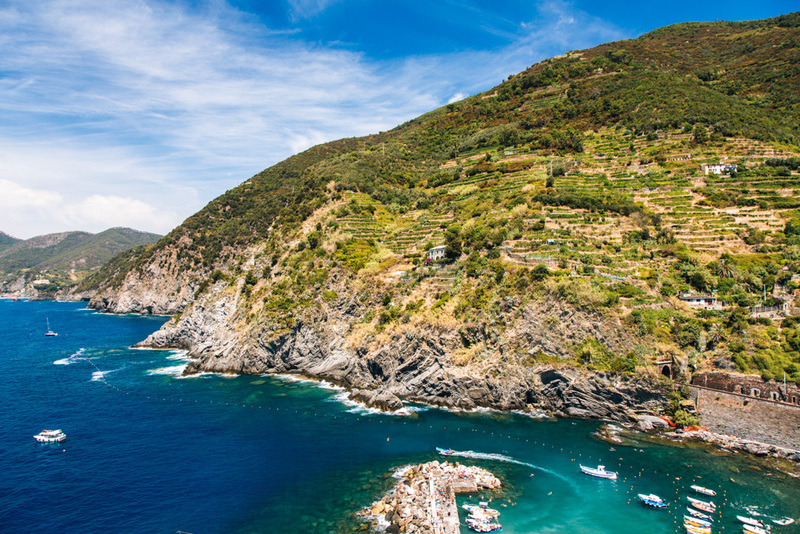 I had a couple of must-dos for this trip, one of which was Cinque Terre (the “five lands”). 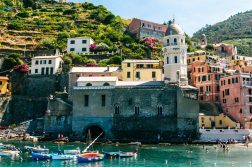 This stretch of coastline is famed for its picturesque villages with colorful buildings and green terraces, and not surprisingly it’s become very touristy in recent years. More than anywhere else I’d be visiting, I was extremely concerned about the summer crowds here and whether they would put a serious damper on my experience. Everywhere I looked, whether it be other travel blogs or people IRL who had been before, the general consensus seemed to be: “don’t go to Cinque Terre in summer!” (see exhibit A, B, C, D). Well shoot. I wasn’t about to skip this bucket list destination just because everyone else was crapping all over it. So instead, I mentally prepared myself for crowds galore and jumped in with cautious optimism. 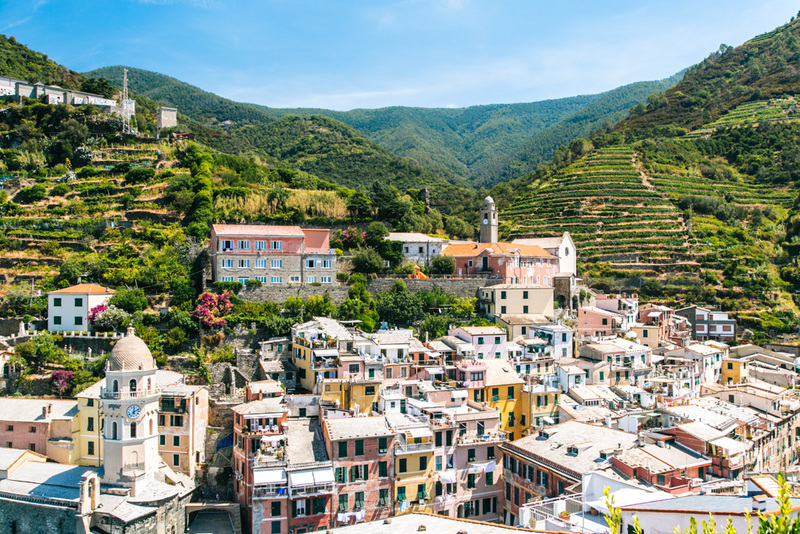 Step 1 to tackling Cinque Terre in summer (or other popular European destination) is managing your expectations. Given that I was visiting a very touristy location during peak season, I certainly wasn’t expecting to have plentiful elbow room at all times. Instead, I was fully anticipating having to weave my way through crowds, wait in line to dine at restaurants, and shuffle my way along the hiking trails due to the massive seasonal swell in visitors. 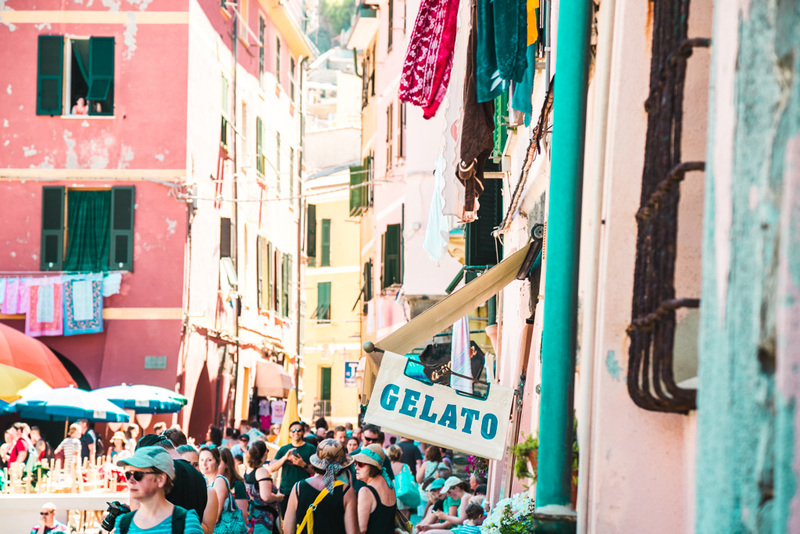 Crowds around midday in Vernazza. Didn’t get seated til after 9pm but SO worth it for the tuna! I fancy myself an eternal optimist, so I wouldn’t say I was pessimistic about it. I was definitely still insanely excited to visit this incredible place, but realistic about the conditions before I even got there. Having reasonably “low” expectations for Cinque Terre in July made it so much sweeter when things turned out better than I’d hoped. For instance, I was shocked to find myself completely alone while hiking certain parts of the Sentiero Azzurro from Corniglia to Vernazza. Much less surprised, however, to find the beach at Monterosso completely packed later that afternoon. 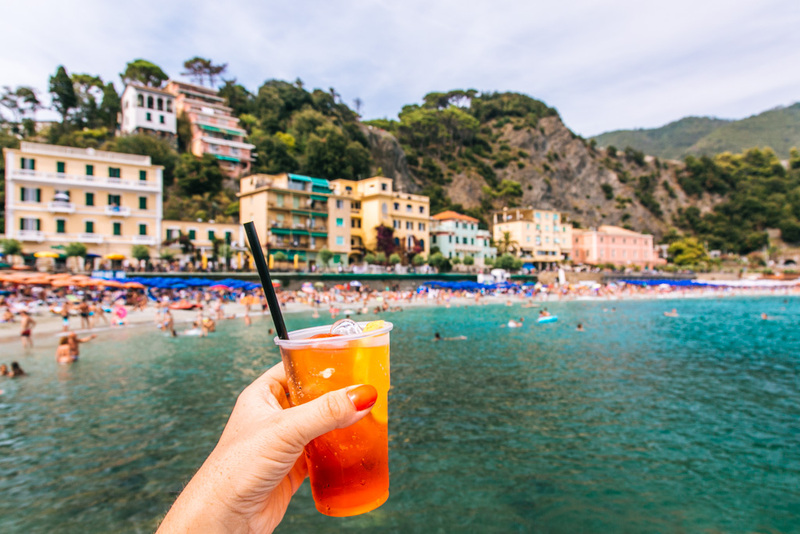 It worked out well, though, because we found ourselves some flat rocks just off the beach to spread out on instead, and close enough to make periodic runs to the beach bar to refill our cups with aperol spritz. Bliss! Crowds at the beach in Monterosso around mid-afternoon. You may not have any control over the summer crowds, but you do have control over your actions and your reaction to them. Do most of your exploring EARLY (before 10am) or around sunset when most everyone is getting ready to have dinner. Eat a late dinner (like 9:30pm). 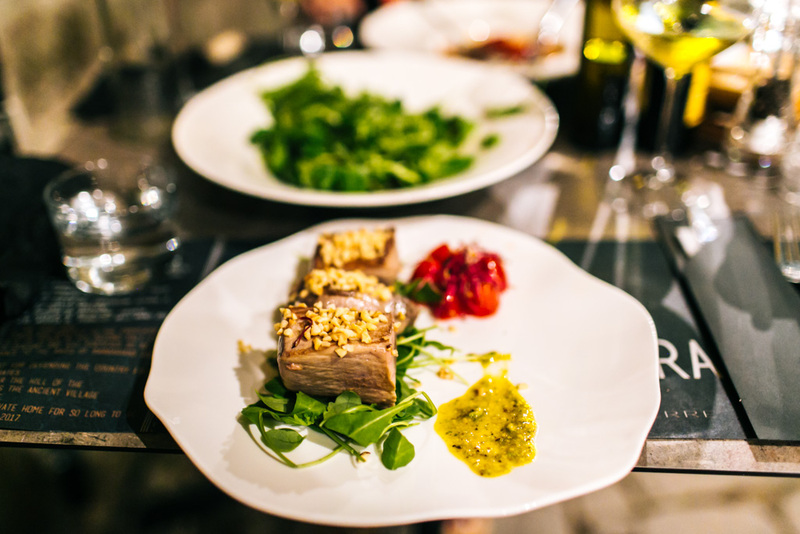 As mentioned above, there will be fewer people on the streets around prime dinnertime (7:30-9:30pm) which makes it an ideal time for exploring, and also fewer people dining in the restaurants at such a late hour (9:30pm and on). Go swimming! There are far less people in the water than there are on the village streets at any given time. Hang out at some of the semi-hidden beaches around the villages that take a bit more effort to find or reach (see below). 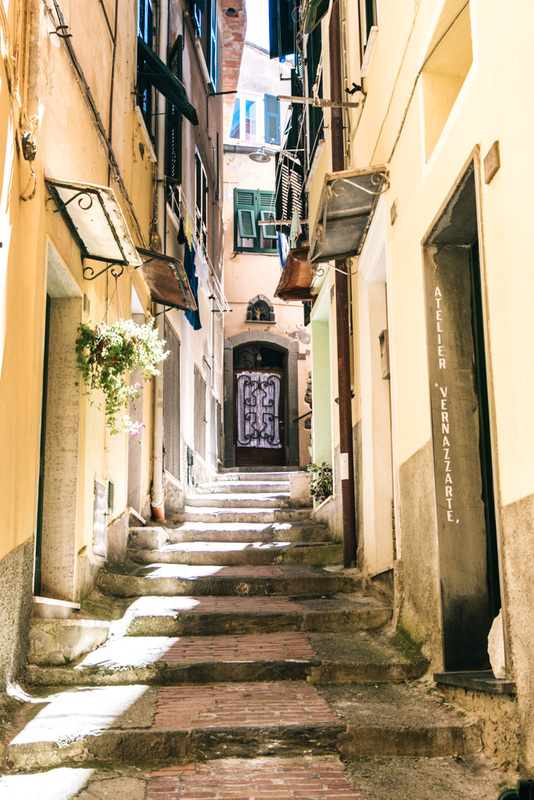 Go to Corniglia, rather than the other 4 villages. It takes more effort to get to than the others since it requires walking up 384 stairs from the train station (or a quick shuttle bus), so there tend not to be as many people here. 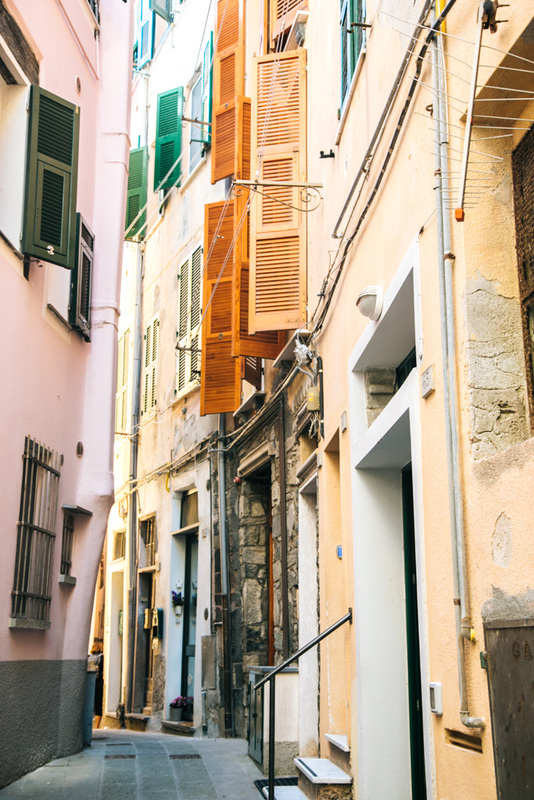 Venture away from the 5 villages and explore other towns along the Ligurian Coast (e.g. Portovenere, Portofino, Camogli, Sestri Levanti). Corniglia from the hiking trail. Here’s the crazy thing, though: after having been to Cinque Terre in summer, I can’t imagine experiencing it at any other time of year. The beach scene was one of the things that made my time there so memorable and enjoyable. In all of the 5 villages, there were people swimming, sunbathing, and cliff jumping along the coast during the day. A refreshing dip in the sea or cool breeze offered a temporary and much-needed respite from the intense summer heat. Admittedly it was often tricky to find space to lay out my towel, but at least there were far fewer people by the water than there were wandering around the village laneways every afternoon. 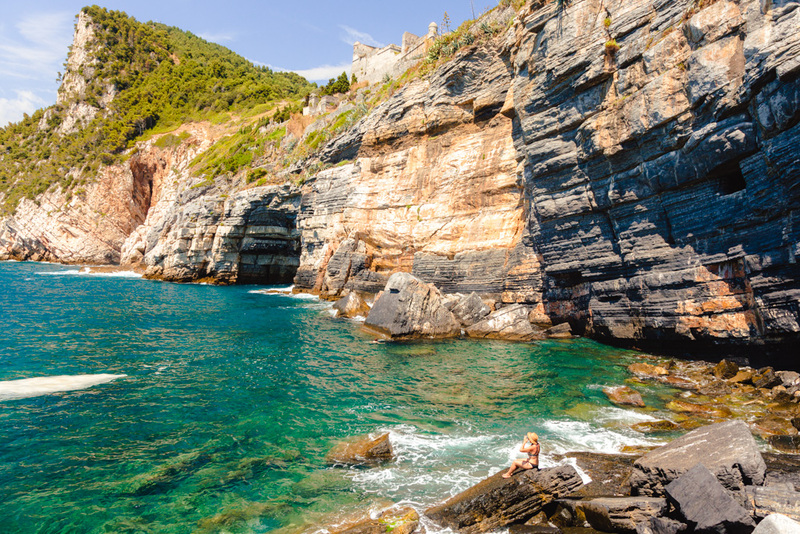 Escaping the crowds at the grotto in Portovenere. 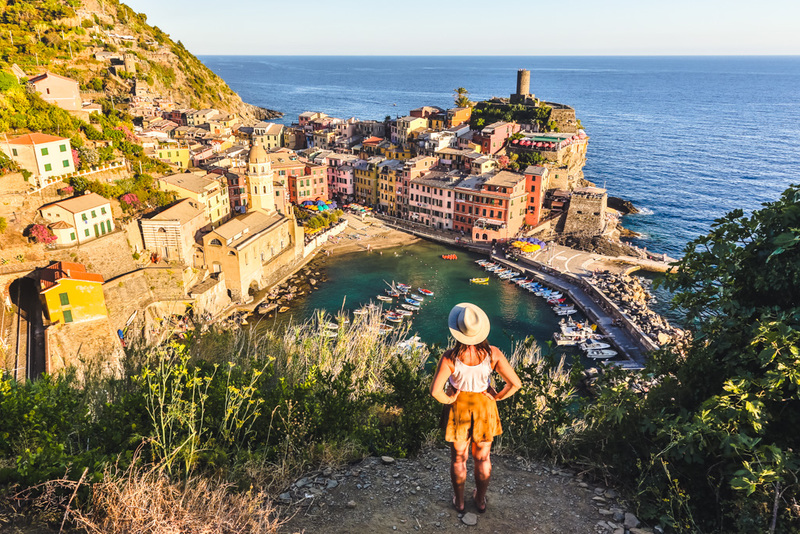 Quite possibly my favorite memory from my time in Cinque Terre in July was being in/on the water, glimpsing down the scenic coastline and then back inland toward the colorful tiered homes in whichever village I happened to be in. Sure, you could probably enjoy a similar view from a restaurant perched on a hill or a designated viewpoint, but for me it felt the most magical and the most real when I was closest to the water. 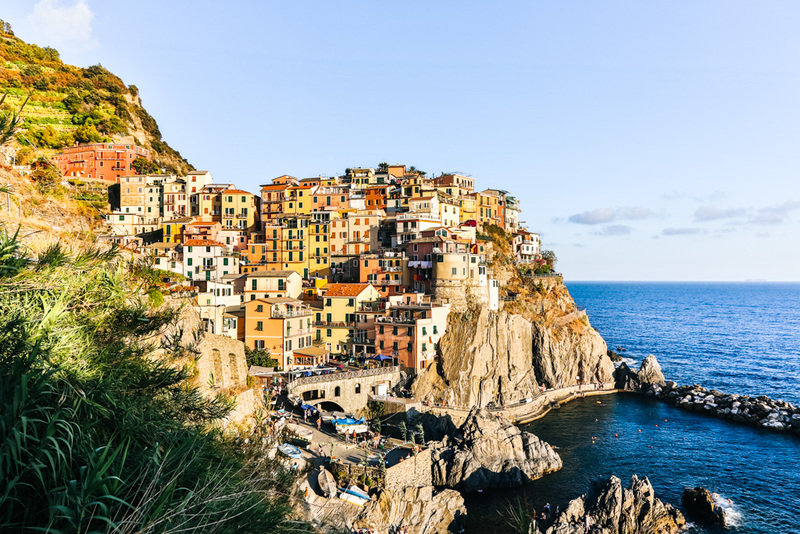 I think the absolute best swimming spot to feel this magic is in Manarola in late afternoon, within the 2 hours before sunset when all the homes are bathed in golden hour light. 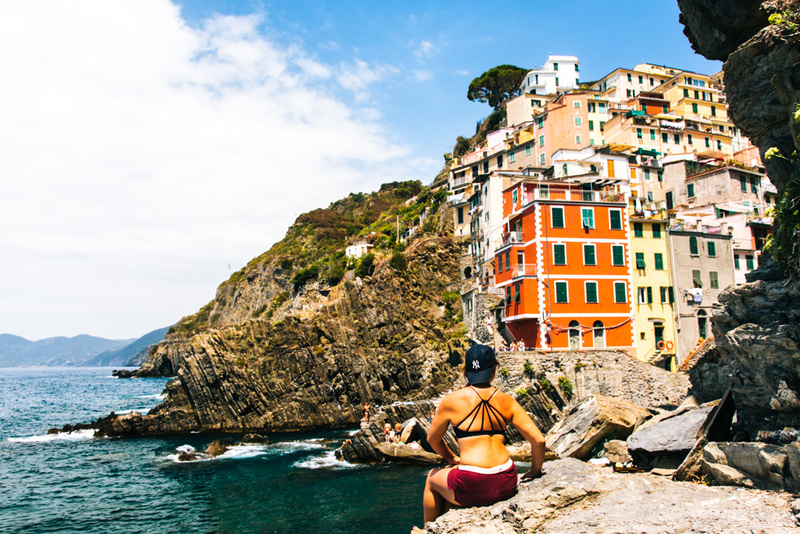 The beaches in Cinque Terre aren’t the typical stretches of sand typically associated with the beach, so instead you’re laying out on the rocks, hills, docks, or concrete along the waterfront. 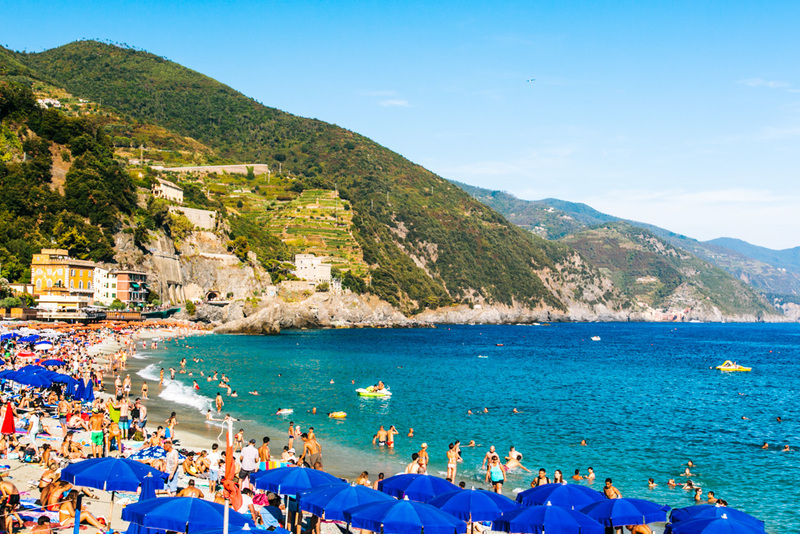 Monterosso is the one village with a proper beachfront, but much of it is reserved for resort guests or those who shell out to rent umbrellas and beach chairs. 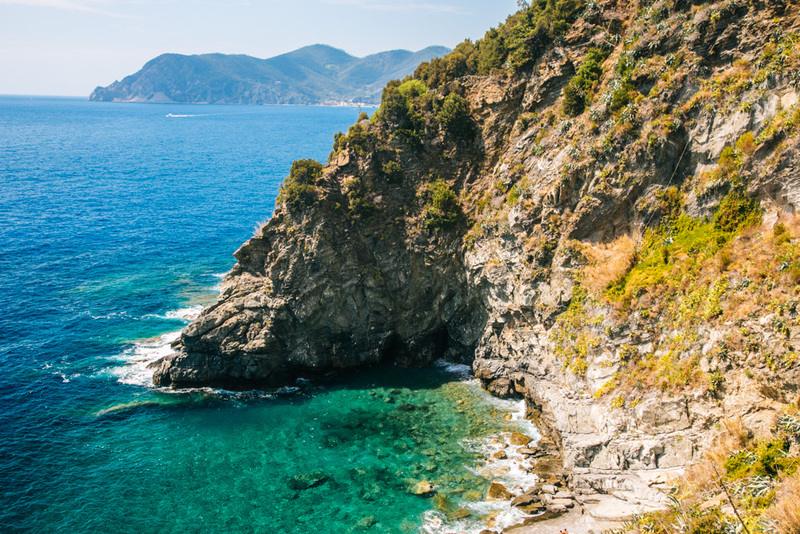 Definitely get to Monterosso early if you want to grab a spot in the sand (well, it’s more like tiny pebbles than actual sand). Otherwise, you’ll have to get creative with your sunbathing spot at one of the other villages. 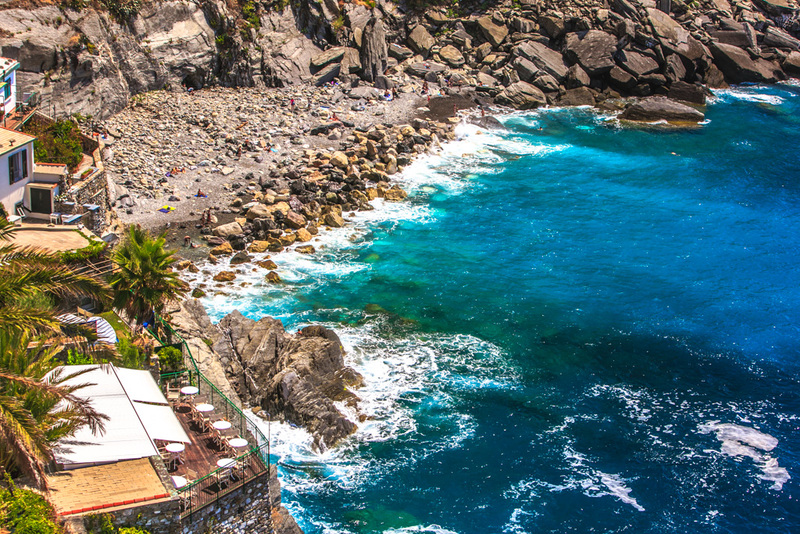 A couple of less-frequented beaches in Cinque Terre include the one in Corniglia (just follow signs from the village for “marina” and walk down a whole lot of steps), and the hidden grotto in Vernazza (visible from the trail checkpoint before you descend into town; there’s a little tunnel off the main street that leads to it). 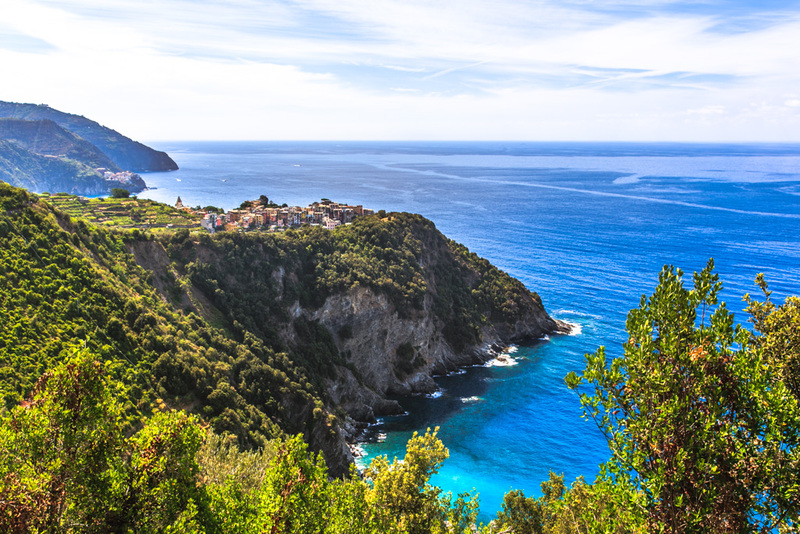 Seriously, if you’re a beach bum like me, you’ve GOT to visit Cinque Terre in August or July. It’d be an entirely different (read: inferior) experience without the beach scene. 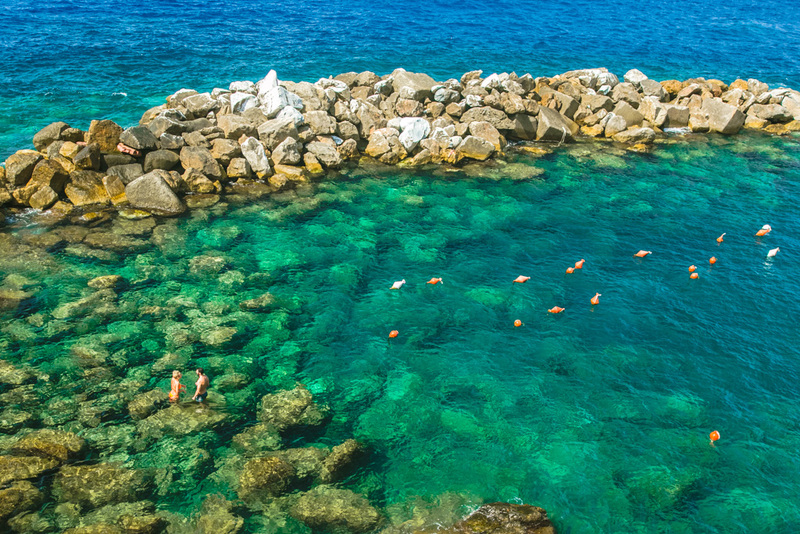 A lagoon to themselves in Riomaggiore. 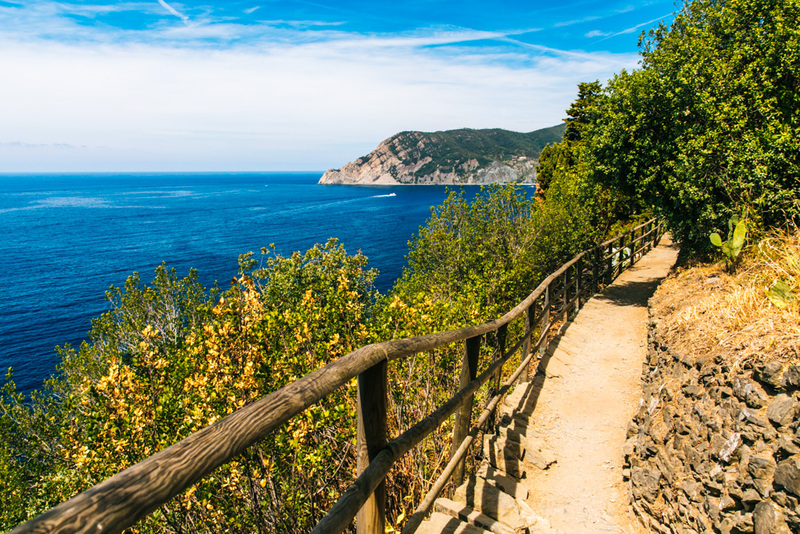 Is Cinque Terre worth it in the summer? Absolutely! 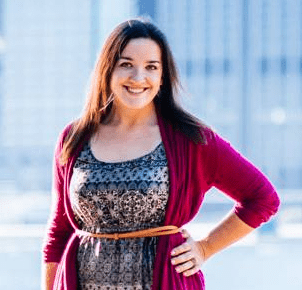 Every single day I was there, I thought to myself in disbelief: They were WRONG! 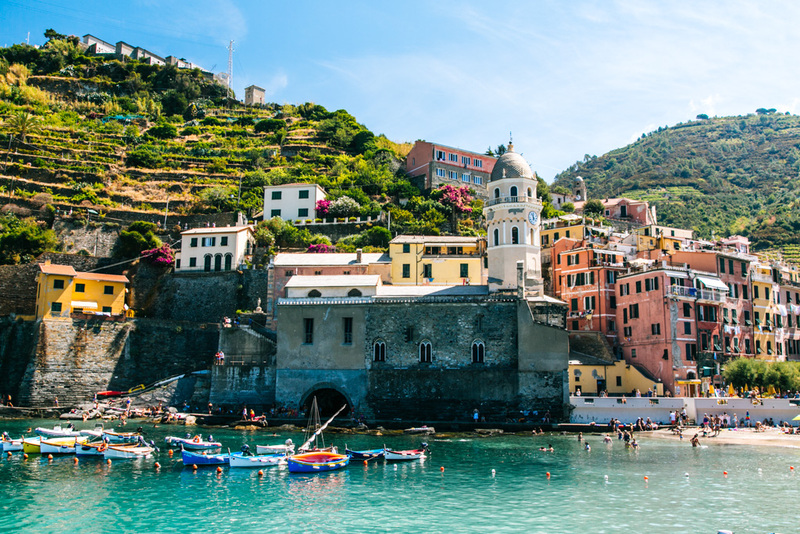 How could anyone possibly say it’s not worth doing Cinque Terre in summer?! You guys, it is 100% worth it. 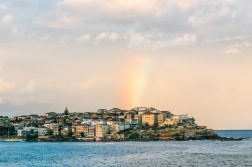 Sometimes you don’t have a lot of flexibility in your travel dates and your only option is to visit a place during peak season, or rainy season – aka not the ideal option. But if you go into it with realistic expectations and make an effort to avoid the crowds whenever possible, you can still have a phenomenal time. It’s all about perspective. I’m so glad I didn’t listen to all the naysayers and Debbie Downers and braved peak summer crowds in Cinque Terre. It was the highlight of my entire 3.5-week Euro trip and a place I now hold very highly on my growing list of travels.